Born in May, 1963 and graduated from Dalian Maritime University in 1983, an experienced Master Mariner through years of shipboard services from 3rd officer, 2nd officer, Chief Officer to Captain. In addition to his maritime qualifications, Capt.Xie is a Senior Economist and EMBA holder from Shanghai Maritime University. 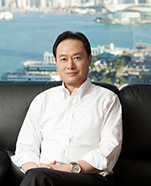 Before he joined to CMES, Capt.Xie worked in China Shipping (Group) Company consecutively as Managing Director of China Shipping(Indonesia) Co.Ltd., Managing Director of China Shipping(Netherland) Agency Co.,Ltd., Vice President of China Shipping (Europe) Holding Co.Ltd., Chief Representative in Mediterranean and Deputy General Manager of China Shipping Development Co., Ltd.
From Oct.2012 until now, Capt.Xie served as the President of China Merchants Energy Shipping Co., Ltd.